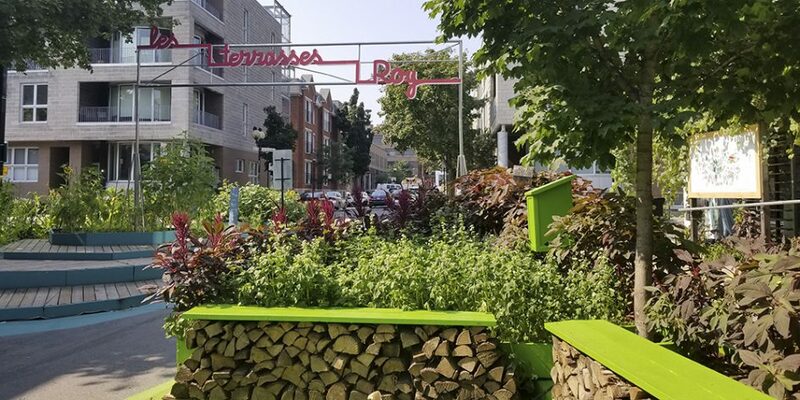 This pedestrianization and development are projects of the borough Le Plateau Mont-Royal, which is the instigator and the manager of the Terrasses Roy. You can also contact them if you have questions or comments. The Roulant cultivates and animates this space all summer long. Access to and harvest of the vegetables and herbs in the gardens will be completely free to all. Each of the small islands built will be dedicated to a type of crop. One of them is devoted to the 3 sisters, using the technique of companionship with a vegetable palette made up of corn, climbing beans, squash, peas, and melon. A second is dedicated to herbs, with a constellation of herbs (parsley, dill, lemon balm …) and edible flowers (thought, worries …). The third island honors seasonal fruits including strawberries, raspberries, and cherries. Finally, the fourth blooms white clover, marigold, mesclun greens and other wonders in a magnificent vegetable garden. These facilities also create opportunities for us to talk about food security. Please do not hesitate to discuss these edible gardens with Marie-Anne, the manager of the urban agriculture program at the Roulant. This pedestrianization is temporary. The Plateau Mont-Royal borough predicts new installations and a permanent pedestrianization of the street in the near future. We hold most of our summer community events in this space, as well as most of our agriculture workshops and other events. Above all, our farmer’s market on Thursdays is held there from June to November. These activities and facilities are completely accessible to all, regardless of your level of mobility. 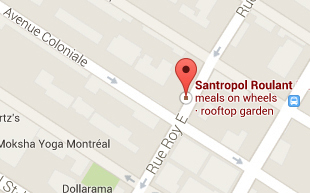 Where is this Terrasses Roy located?